Last week I shared to you the many advantages of getting an online bank account. You can read the post HERE. Thank you for the positive feedback from all SavingsPinay readers. I am really happy to have shared a valuable information to everyone. Now to keep up with all these “valuable information,” I decided to give you Investment Options You Can Try With Your Bank. I know how most of us will have a savings account for our spare money. Yes, having a savings account is indeed a good primer to save money and not waste it but it won’t make you achieve financial freedom. Investing is one of the many ways that you can make money work for you. It is something highly suggested by financial planners to start thinking about a good investment venture to try. I know for a fact that not everyone is into investing. Others feel uncomfortable entrusting the money they worked hard for into something high-risk. 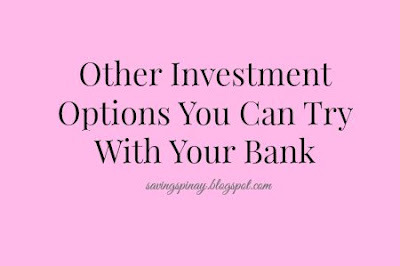 So for these type of people who can’t take the risk of a mutual fund or stock investing, here are investment options you can try that your bank should probably offer. This is something I already featured in a past blog post. Read: What is UITF? Unit Investment Trust Fund or UITF for short is a collective investment thing that banks offer. Think of it as a mutual fund but instead of a trusted private financial group like FAMI, known commercial banks provide this investment option to the public. Money from various investors are pooled together into one fund to accomplish an investment objective. To Whom Do I Recommend UITF? If you don’t have much knowledge about stock market or trading and you don’t have that much time to really look after your investments, then UITF is for you. I also recommend this to people who just started knowing the benefits of investing and are a dad or mom looking for a better way to save up for the future. Depending on the bank you will choose, opening an account is as low as 10,000pesos. You can top up this with as low as 1,000pesos a month. Definitely promise higher return than a savings account. Return will depend of where your money is being investment more commonly known as a portfolio. Your bank will most probably explain how much percentage goes to real estate, information technology companies etc. READ: What is Peso Cost Averaging Method? The above investment options may sound foreign for common individuals who are just new to investing. Retail Treasury Bonds, Treasury Bonds and Treasury Bills are backed up by the government so they are pretty safe investment. Let me differentiate the three from each other based on their meaning. How Retails Treasury Bond, Treasury Bonds and Treasury Bills Work? Retails Treasury Bond (RTB) is a fixed-income instrument issued by the government as a way of raising funds. Treasury Bonds are similar with Retails Treasury Bond but this investment option requires a lower initial investment amount. Treasury Bills are almost similar with Retail Treasury Bond and Treasury Bonds but unlike RTB and Treasury Bonds, Treasury Bills are considered short term investments. To Whom Do I Recommend? 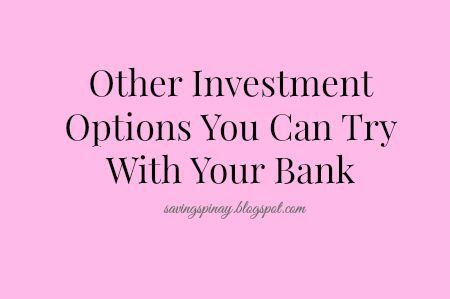 These investment options are perfect for those who have more money to start investing with and also those who have spare money to invest in a long term basis. Retail Treasury Bonds, Treasury Bonds and Treasury Bills need at least 100,000pesos to start investing. Aside from Savings Account, Time Deposits are the most common investment option of Pinoys. To Whom Do Recommend This? This is a perfect investment for someone who don’t have that much money for RTBs, Treasury Bonds and Treasury Bills but want to earn an interest higher than usual savings account. For this I suggest that you choose your bank carefully. This actually depends on the bank of your choice. There are banks offering a Time Deposit Certificate for just 10,000pesos. The higher the money you will leave in the bank and the longer the investing period is, the higher the return. Time Deposits are not considered as high risk because you literally just make your money seat in the bank and wait for it to mature. Interest range may be between 1.5% to 3.5% which is significantly higher compared to usual savings account. How to Achieve Financial Stability in Your 20’s – New! I already got my UITF from BDO! Yeah! These are great tips for those who are in the process of planning their investments or savings. I believe that college students now should start saving (through their allowances) and investment in any of these. It's something I wished I have done before so I have bigger savings and even an emergency fund. Go lang ng Go in achieving financial freedom!! I love your blog!!! From PUP ka din po? Hi Ms. Louise! Yan din yung isa sa mga goal ko why I started this blog. I want college students or yung mga nasa early 20's nila to know that the earlier they save and invest, the better.